China is the largest e-commerce market in the world with sales forecast to hit $1 trillion dollars by 2018. Edd Hardy of World First looks at what an increasingly open FX market could mean for online sellers with one eye on China. The growth of the Chinese economy over the past two decades is unprecedented in modern economic history. The rise of the Chinese consumer and the increasingly ‘open’ signs from the largest economy in Asia has led to a breaking down of borders between the Far East and the western world. Historically, the controlled and restricted FX market in China made payments in Chinese yuan (CNY) particularly difficult. However, the decision from the powers-that-be to liberalise the way in which China interacts with countries across the world is opening up the possibility of cross-border CNY payments. This has already begun saving time, effort and money on both the sending and receiving sides of the transaction. Until 2005, China’s yuan was pegged to the US dollar (USD), meaning the Chinese central bank intervened in the FX market to ensure a stable and unchanging exchange rate with the United States. As such, countries looking to trade with China would be more sensitive to fluctuations in the US dollar as opposed to any rates that reflected China directly. As the Chinese economy grew, this exchange rate transitioned from being fully centrally planned to partially managed, as the CNY was permitted to fluctuate against the USD by a narrow margin in order to more accurately reflect the currency’s value. This narrow margin has been gradually widened in recent years and now stands at +/- 2% against the USD on a daily basis. 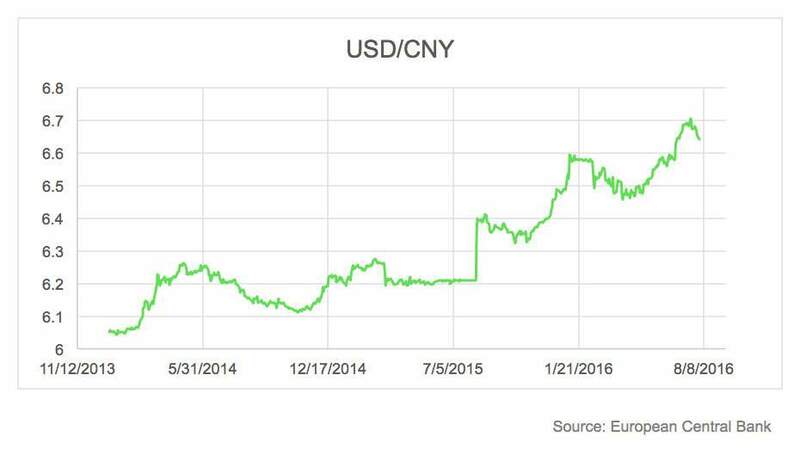 This means that the USDCNY exchange can only rise or fall by up to 2% on any given day. just the US dollar and few others. What does this mean for international payments? Where firms were previously forced to pay their Chinese suppliers in US dollars regardless of whether they were based in Amsterdam, London or Bangkok, the opening up of the Chinese FX markets now allows firms from the Eurozone to the UK to Thailand to directly purchase CNY to make international payments. This allows corporates the world over to benefit from cheaper, faster and more efficient transactions when making payments overseas. For businesses and e-tailers selling to Chinese customers, getting sales revenue in CNY back to your native currency can be a more difficult process. To take advantage of the growing consumer base in China, firms will need to utilise providers like Alipay who now allow online sellers to integrate its payment system on their website. Alipay is mandatory for all Alibaba owned marketplaces like Tmall.com so online sellers looking to have a presence in China will probably need to get to grips with what is now one of the world’s largest payment platforms. Whilst Alipay’s market share in the region is enormous, there are other providers like Tenpay and Union Pay that e-tailers should consider to support a combination of payment methods. The ultimate combination is Alipay and an online bank, like Union Pay so as to reach customers who don’t have Alipay accounts. Edd Hardy is a Market Analyst at World First.